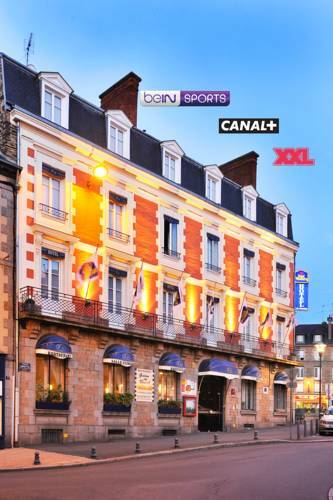 Here is the list of the hotels near Saint-Georges-de-Chesné. Book your hotel near Saint-Georges-de-Chesné today, Monday 13 May for the best price, reservation and cancellation free of charge thanks to our partner Booking.com, leader in on-line hotels reservation. Below here is the list the 50 closest hotels of Saint-Georges-de-Chesné, sortable according your criteria. You will find the position of these accommodations on the Saint-Georges-de-Chesne hotels map. Set in a 16th-century manor house surrounded by a park with trees, this property features offers views of the pond, free internet access and a terrace. The Couesnon Valley is 5 km away. Free private parking is available. Opening onto the park, all of the rooms at Au Domaine de Rimou include a private bathroom. A continental breakfast is served every morning at an extra cost. Savoury meals can also be requested at an extra fee. Evening meals prepared by the hosts can be enjoyed at an extra cost if you reserve 24 hours in advance. You are invited to visit the Combourg Castle, which is 20 km away and Mont Saint Michel, which is a 30-minute drive away. Tree climbing can be done in Villecartier Forest, which is 15 km from Au Domaine de Rimou. The property is accessible via Combourg Train Station. Offering free WiFi and garden views, Gîte de l'hamelinaie is an accommodation situated in Montanel. Guests have a private terrace. The holiday home includes 3 bedrooms and a kitchen with a dishwasher and a coffee machine. A flat-screen TV is available. Guests can also relax in the garden. Le Mont Saint Michel is 27 km from the holiday home. Dinard Bretagne Airport is 65 km from the property. Below here is the hotels map of Saint-Georges-de-Chesné. Names and details of Saint-Georges-de-Chesné hotels can be shown on the map clicking on the prices icons.